There’s something special about Sunday breakfast. It’s a day of rest and relaxation before the new week begins, and since breakfast is the most important meal of the day, Sunday breakfast deserves a little extra attention. We try to make something super delicious on Sundays – pancakes and fruit, a southwestern egg scramble, egg bagel sandwiches, you name it! – with an extra-large pot of coffee to wash it down. This past weekend, I decided to try my hand at baked eggs for our sacred Sunday morning feast. I used some of the veggies I happened to have in the fridge, and I think you could make something similar with other veggies, sausage, ham, goat cheese, peppers, or any other favorite toppings! 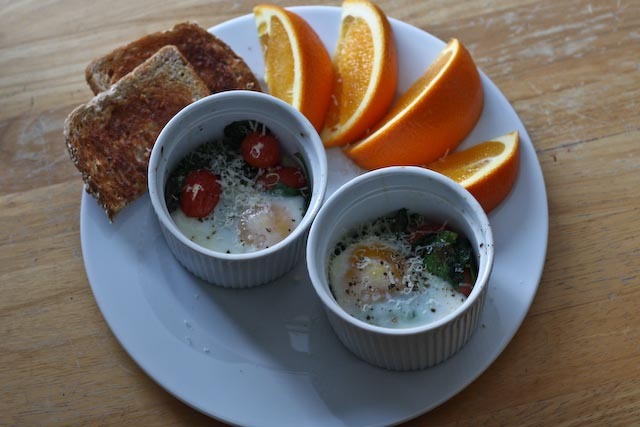 I used small ramekins to make “mini” baked eggs. You could easily use larger baking dishes to make two- or three-egg servings. 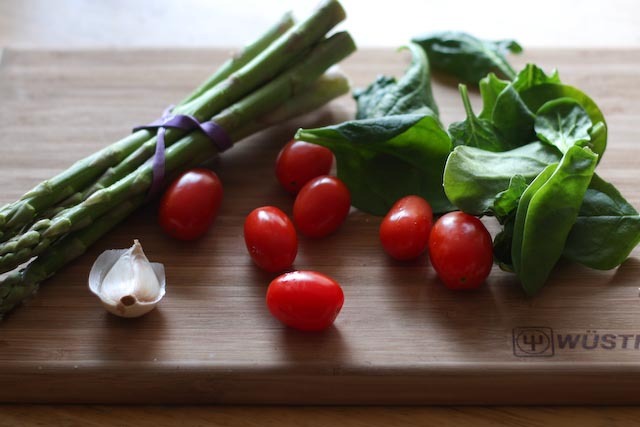 A quick saute helps the spinach and tomatoes cook nice and evenly. I used fresh as opposed to frozen spinach. Frozen spinach, even when strained well, still holds a lot of excess water. Since I don’t particularly care for runnier-than-necessary eggs, I opted for fresh (plus I think fresh spinach retains nutrients better than frozen). 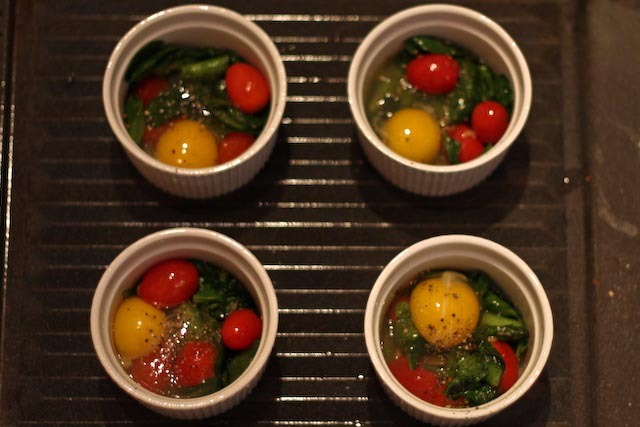 I filled the ramekins with the sauteed tomatoes and spinach and cracked an egg in each dish. Sprinkled with a little salt and pepper, these puppies are ready to broil! Five to six minutes later – et voila! Baked eggs! (OK broiled eggs, but baked just rolls off the tongue a little better). I topped each with a bit of grated Parmesan. Now that’s a delicious Sunday breakfast! I hope you give baked eggs a try for a relaxing Sunday morning. In a saute pan drizzled with olive oil, add the minced garlic and cook for about a minute over medium heat, taking care not to burn the garlic. Add the asparagus and cook for about 5 minutes. 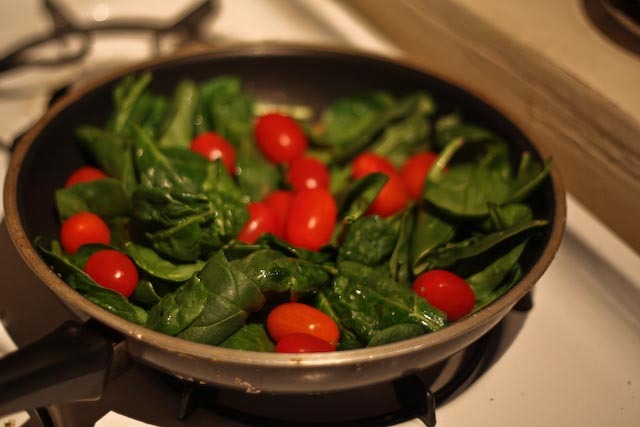 Add the spinach and tomatoes and cook, stirring occasionally, for about 3 minutes, until the spinach is just wilted. 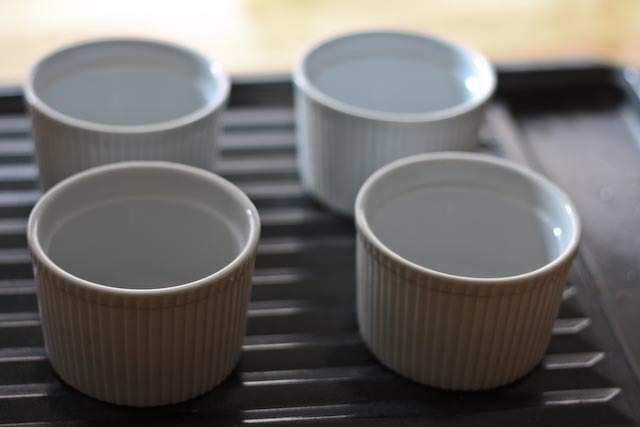 Remove from heat and divide the vegetables among 4 ramekins, prepared with cooking spray or olive oil. Meanwhile, start the boiler in the oven. 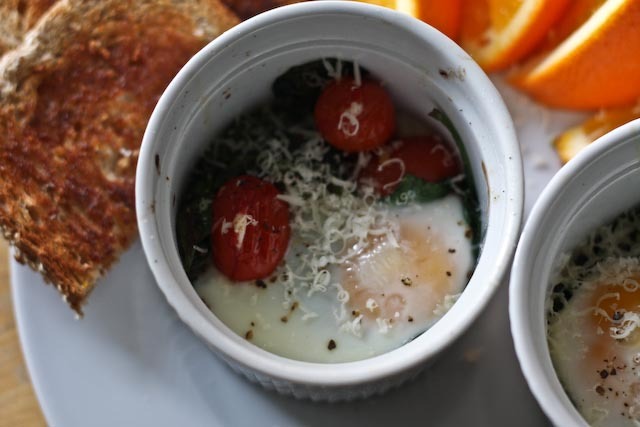 Crack an egg into each ramekin and place the ramekins on a baking sheet. Broil for about 5-6 minutes, or until the whites of the eggs are just cooked through. Remove from the oven and let stand for about a minute. Sprinkle with freshly grated Parmesan cheese and serve warm.